Editor’s Note: This presentation was given by Christophe Willemsen at GraphConnect San Francisco in October 2016. 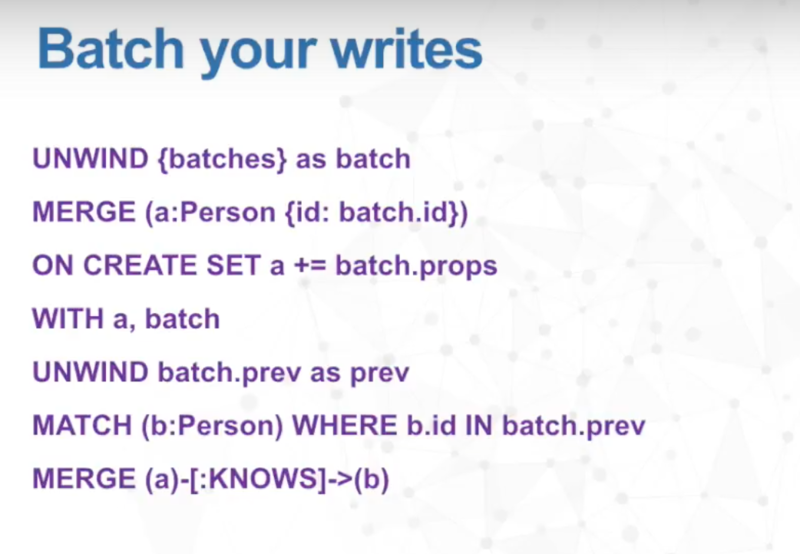 In this presentation, Christophe Willemsen covers a variety of do-and-don’t tips to help your Cypher queries run faster than ever in Neo4j. First, always use the official up-to-date Bolt drivers. Next, leave out object mappers as they produce too much overhead and are not made for batch imports. Then, Willemsen advises you to use query parameters since using parameters allows Neo4j to cache the query plan and reuse it next time. Also, you should always reuse identifiers within queries because using incremental identifiers prevents the query plan from being cached, so Cypher will think it’s a new query every time. Willemsen’s next tip is to split long Cypher queries into smaller, more optimized queries for ease of profiling and debugging. In addition, he advises you to check your schema indexes. By creating a constraint in your Cypher query, you will automatically create a schema index in the database. The final two tips are to batch your writes using Cypher’s UNWIND feature for better performance, and finally, to beware of query replanning, which can plague more seasoned Cypher users with constantly changing statistics that can slow down queries and introduce higher rates of garbage collection. We will go over a few things not to do and will talk about ways to improve the performance of your Cypher queries. The first thing to keep in mind is that you need to use an up-to-date, Neo4j-official Bolt driver. The next thing to do is completely forget object mappers. You can find Neo4j-ogm in Java, Python, etc. but when you want to write fast and you need to write personalized queries for your writes and domain, the Object-Graph Mapper (OGM) adds a lot of overhead, is not made for batch imports and keeps you from going fast. So if you want to write 100,000 nodes as fast as possible, it doesn’t make sense to use object mappers. This will query the three people mentioned, but Cypher can cache the query plans, so using parameters allows Neo4j to cache the query plan and reuse it next time, which increases query speed. Using P1, P2 and P3 (etc.) completely prevents the query plan from being cached, so Cypher will think it’s a new query every time, meaning it has to make statistics, caching, etc. Avoid long Cypher queries (30-40 lines) when possible by splitting your queries into smaller, separate queries. You can then run all of these smaller, optimized queries in one transaction, which means you don’t have to worry about transactionality and ACID compliance. A query of two lines is much easier to maintain than one with 20 lines. Smaller queries are also easier to PROFILE because you can quickly identify any bottlenecks in your query plan. Just remember: A number of small optimized queries always run faster than one long, un-optimized query. It adds a bit of overhead in the code, but in the end, you will really benefit from that overhead. So you can see in the query plan that it is doing a node by label scan. If I were to have 1000 people, it would try to find 1000 people checking if the value for the MERGE is the same. If not, it will create a new node. But whether it’s 1000, 1000000, or 10000000, your query will grow in db hits, so it won’t be as fast as you want it to be. If you have a constraint on the person ID, then the next time you do a MERGE — which is a MATCH or CREATE — the MATCH will an 01 operation so it will run very fast. The new query plan is NodeUniqueIndexSeek, which is really an 01 operation. In our earlier examples, we were creating a new query to create one node. You can defer your writes at the application level for example and keep an array of 1000 operations. You can then use UNWIND, which is a very powerful feature of Neo4j. It will iterate this array and then do an operation: create a person and setting the properties. In this array, the person also has to be connected, so we create person nodes and relationships to the other people. The following relates to a problem that typically faces more experienced Cypher users in production scenarios. That is, query replanning. When you are creating a lot of nodes and relationships, the statistics are continually evolving so Cypher may detect a plan as stale. However, you can disable this during batch imports. Consider the following holiday house recommendations use case: Every house node has 800 relationships to other top-k similar houses based on click sessions, search features and content-based recommendations. The problem we encountered was that in the background, we were constantly recomputing the similarity in the background, deleting every relationship and recreating new ones to the new 800 top-k similar relationships. But if you were to look in the Neo4j logs, it would always be a query detected as stale, then replanning, then the query being detected as stale, then replanning and so on. The first outlines the parameters for the limited lifetime of a query plan before a query is considered for replanning. The second is the threshold for when a plan is considered stale. If any of the underlying statistics used to create the plan has changed more than this defined value, the plan is considered stale and will be replanned. A value of 0 always means replan, while a value of 1 means never replan. I discussed with the Cypher authors yesterday, and they are maybe thinking of adding this factor on the query level, because these configurations impact all of your other queries as well. So this is something you can use for making your writes faster in the first batch import. It is better than restarting Neo4j, because all your MATCH queries and your user-facing queries will be impacted by this. Inspired by Christophe’s talk? Click below to register for GraphConnect New York on October 23-24, 2017 at Pier 36 in New York City – and connect with leading graph experts from around the globe. 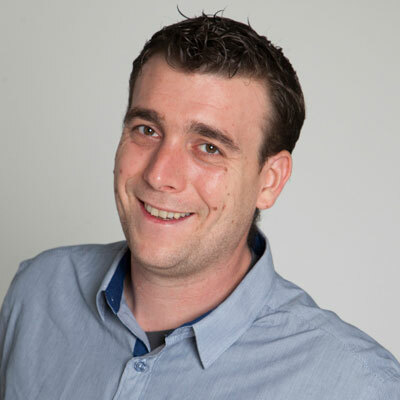 Christophe Willemsen is a Principal Consultant at GraphAware, where he has been involved in many big enterprise-grade projects using graph databases – from product information management, fraud detection and impact analysis to recommendation engines and social networks. What do you mean by “01 operation”, is their any link explaining the same? Late response but it’s probably meant to say O(1) which is a constant time operation. Read about asymptotic complexity if you want to know more.